Mike has been an industry-leading drum educator for the past 11 years. He is listed by Modern Drummer magazine as one of the top drum instructors in the United States, as chosen by drumming's global ambassador Dom Famularo. 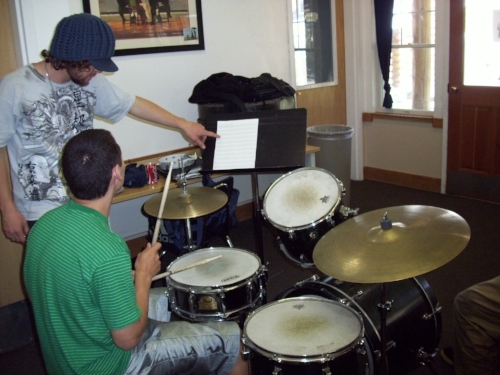 The primary focus of his teaching is to establish a solid foundation of proper technique, basic rudiments, and reading. He then adds skills such as coordination, independence, timing, groove, musicality, and improvisation while incorporating elements of rock, funk, jazz, latin, drum n' bass, hip hop, and any other styles the student expresses an interest in learning. His teaching also focuses on developing listening and transcription skills, as well as using recording techniques to analyze and improve one's playing. The lessons are accompanied by an undercurrent of various relaxation and breathing techniques. Mike currently maintains an active teaching schedule in the Tahoe/Truckee/Reno area, as well as through Skype/Google Hangouts/Facetime. His lessons are conducted on a one-on-one basis, and are offered to students of all ages and ability levels. His students have gone on to successful auditions for the Reno Youth Philharmonic, placements in high school orchestras and jazz bands, music majors in college, and successful careers as teachers and players. Most importantly, Mike focuses on sharing the joy that comes with learning the art of drumming. To schedule a lesson with Mike, please click the link at the bottom of this page. Mike is a wonderful teacher with a great sense for his student's different styles of learning. He personalizes his classes to your needs to make it an overall very enjoyable experience. Mike Adamo's professionalism, dependability, and musical knowledge are top notch. And, in every single lesson, he has exceptional patience with his students. We are grateful to have Mike as my son's drum teacher for over three years now. I just want to thank you for being my drum teacher and helping me become a better drummer. You have really helped me improve my skills and I can't thank you enough! Thank you so much for teaching me how to play the drums and being so nice to me. Thanks for being such a great teacher! I really appreciate all your time and effort. Thanks so much for all you do. Clay so enjoys his time with you. Thank you for being the best drum teacher ever! Thank you for being a great drum teacher. Satchel always looks forward to his lessons with you. Mike is professional, kind and incredibly talented. We are so fortunate to have found him. Mike never ceases to surprise and amaze me. He always comes prepared with a number of new things to learn, and is very professional and organized. I learn so much each time I work with him and he gets me so fired up about music. I always play for another hour after he leaves trying to nail the subject we were working on. Having Mike as a production teacher was an amazing choice from day one. Every time he comes over, my productivity increases and an hour lesson feels like fifteen minutes. He gives a amazing feedback, and he frequently allows me to find new tools for new sounds/styles. I’ve produced an album with him over the past year and he was with me every step of the way. After 20 years of not playing drums, I recently picked back up some sticks. I find myself more enthusiastic about drumming than ever, thanks in large part to Mike’s influence. He’s a great listener, caters each lesson to my needs, is passionate, and cares. I can’t imagine a better drum teacher. Mike's compelling combination of deep music knowledge, masterful technical ability, and adaptable teaching style has made our drum lessons something I look forward to weekly. He's also a really kind guy. I'd recommend him without hesitation.